Alyssa Valdez and Amy Ahomiro of Ateneo are teaming up with NCAA stars Gretchel Soltones and Alyssa Eroa in the coming Shakey's V-League season. ALYSSA Valdez, Amy Ahomiro and other former Ateneo Lady Eagles will be joined by San Sebastian standouts Grethcel Soltones and Alyssa Eroa in a team called Bali Pure for the V-League Open Conference opening on Sunday. V-League commissioner Tonyboy Liao told SPIN.ph a deal with a corporate sponsor has yet to be secured, but the team made up mainly of former Lady Eagles will be carrying the colors of Bali Pure, a local water station. "May team na si Alyssa, it's Bali Pure," said Liao. 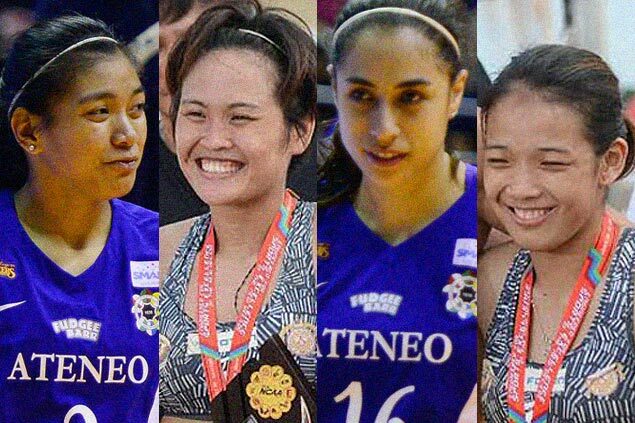 Other former Lady Eagles in the team are Charo Soriano, Gretchen Ho, Denden Lazaro, Bea Tan, Dzi Gervacio and Amy Ahomiro, who, like Valdez, played his final year with Ateneo in the last UAAP season. Also suiting up for Bali Pure is former San Beda star Janine Marciano. Bali Pure completes the eight participating teams in the Open Conference of the 13th season, joining Pocari Sweat, University of the Philippines, National University, Air Force, Kia and teams from Baguio and Iriga.